Fennel has a strong and distinctive smell that can help to suppress your appetite and ease digestive disorders. Warming and stimulating fennel has a long tradition as a digestive tonic. The seeds of the herb are crushed to give a strongly scented, sweet, peppery oil. Fennel has potent properties. Used sparily, it has an enlivening, energising and revitalising effect on the mind and body. Fennel’s main action is on the digestion, where it has a regulating and ‘unblocking’ action. It is effective in relieving nausea, indigestion, constipation and flatulence. Use fennel to detoxify your body as it acts as a tonic for the kidneys, liver and spleen. It is also a diuretic, promoting the flow of urine and helping to reduce fluid retention in tissues – as such it is especially useful before menstruation. Fennel also regulates periods and stimulates the flow of breast milk in nursing mothers. Stimulate sluggish circulation with fennel to gain relief from the building up of toxins and fluids. this blend stimulate circulation and helps to clear away accumulated toxins. Make use of fennel’s diurectic action to clean your urinary system. • 25mls of sweet almond. A massage blend of the following oils aids lymphatic drainage of the tissues. 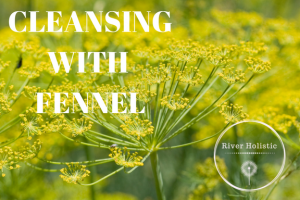 Tone, soothe and regulate the body’s digestive processes with fennel. Apply across abdomen and use a hot water bottle to retain heat. All three of these essential oils work to calm and balance the digestion- but don’t massage immediately after eating as the massage itself can disrupt digestion. Fennel is a natural source of a plant hormone that mimics the female hormone oestrogen. To treat irregular periods, apply a compress containing the following oils added to a bowl of water to the abdomen. • 30ml of sweet almond. • BE SURE TO REMOVE OIL BEFORE FEEDING.